LAKEFRONT, LOG HOME WITH GREAT LAKE AND MOUNTAIN VIEWS. A classic Colorado log home, updated and renovated. Our Log House at Moose Lake Lodge is in a fabulous location on the north shore of Sun Valley Lake. 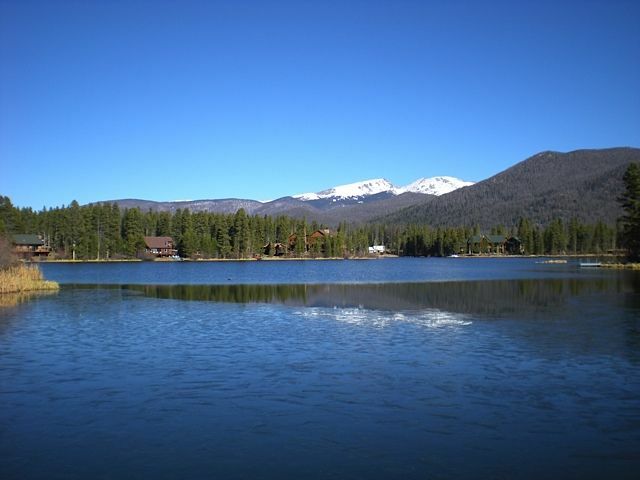 It sits 1/4 mile from Rocky Mountain National Park and Arapaho National Forest, 3 miles from Grand Lake, and is just 100 miles from Denver. The large deck with a wonderful southern exposure offers sweeping lake and mountain views. Western charm abounds in this 2100 square foot, non-smoking home. There are four comfortable bedrooms with one king, three queen, and two twin beds; two baths, one with a steam shower. The main level features a great room with kitchen and dining area. The lower level has a large recreation room with comfortable furniture, TV, and DVD player. Free Wifi. Sun Valley Lake is a secluded private lake. Wildlife abounds in and around this beautiful lake. Many animals including moose, elk, deer, and bear, are frequent visitors. A wide variety of birds nest and feed around the lake. To protect the habitat and environment for the abundant wildlife, no powered boats are allowed on the lake. We provide at least one watercraft for you to use (at your own risk) to enjoy the lake. The lake is a catch and release sport fishing lake. The fishing is usually great! Experience mountain comfort living in this special, magical place. It is a great place to make family memories! Keywords: Lakefront, Log, Home, Moose Lake Lodge, Free wifi. We are a large extended family all of whom love spending time at our lakefront home. Our children loved their time here as they were growing up spending many hours fishing, hiking, boating and exploring. Now our grandchildren enjoy the same opportunities. We are very fortunate to own a home in this pristine lakefront location. The lake, views and wildlife are superb! Probably the best location in the Grand Lake area for seeing moose and other wildlife. Absolute lakefront with lake and mountain views. Enjoy your own private dock and use of our watercraft. Great lake and mountain views. The house is absolute lakefront. Cross-country ski, snowshoe, and snowmobile directly to and from the house. Cross-country ski directly from the house. Beautiful mountain lake which attracts a variety of wildlife. Lakefront! Lakefront - with your own private dock and boats. A gas furnace automatically heats the house in the winter. There are clean linens on the beds. We provide towels, but you may want to bring extras, if you need a fresh towel everyday. Be sure that the flue is open before lighting a fire. There is plenty of parking on our land. We have DSL Internet service. Providing Internet service in the mountains is challenging. It might not be possible to download large files, view movies etc., Works well for emails and surfing the web. We provide towels, but since we are not a hotel we are unable to provide fresh towels each day. Free WiFi available to check e-mails and Internet access. Sorry but Broadband capacity does not allow large file downloads. eg.movies, TV shows, radio programs etc. Wi-fi code is in the guestbook. Full size range and oven. New! Over the range microwave. New! A regular drip type coffee maker. We do provide filters but it is a good idea to bring your own coffee, although you are welcome to use any that is in the house. You are welcome to use any spices, oils, condiments, coffee, tea bags, etc. which are in the house. Plenty of dishes and utensils are provided. The kitchen is brand new and, although not a really large kitchen, it is very functional. It overlooks the lake with great lake and mountain views from the kitchen sink window. Large table on the main level with 8 chairs. Although it is a bit of a squeeze, the table will seat up to 10 using the extra chairs in the house. We provide watercraft, usually a canoe, and/or a small rowboat, and a paddle boat between May and October. No power craft are allowed on the lake. Use of our boats is at your own risk. We provide at least one boat, usually two or three - rowboat, canoe, and/or paddle boats. There is a private dock. Power craft are not allowed on the lake. (2) A large furnished deck overlooking the lake with a great southern exposure. Also a covered entry patio. We provide some life jackets which you are welcome to use at your own risk. We suggest that you bring your own, especially for children, so you know you have PDF's that fit your child. Two ski areas - one about 35 minutes away and another about 50 minutes away. Cross- country skiing from your front door. There are tennis courts at the golf course, about two miles away. Great golf course about 2 miles away. Steam room shower in bathroom. Bed Linens provided, Steam Shower, Huge Sunny Deck. One well behaved, and totally house trained pet is welcome. There is an additional fee. We are absolute lakefront - your private dock is only about 30 feet from the back door. ( Please be aware that some rentals in the Grand Lake area advertise themselves as "lakefront" when in fact there is quite a hike to access a lake.) Lakes freeze in the winter in the mountains. Our lake normally thaws between mid- April and early -May, and freezes again between late October and late November. The lake is usually stocked with rainbow trout by the second weekend in May. That is when the catch-and-release fishing is usually awesome! Perfect place for our end of winter getaway. My 3 boys enjoyed exploring outside in snow. The place was warm and cozy and the perfect location near the snowmobile trails. We can’t wait to go back in the summer time. Gracious hosts and the accommodations were excellent. Rustic, remote, and ten minutes from everything. This is a really unique property. You actually access it by driving through the park, and once you’re there it feels very isolated with only a couple other cabins with an eye sight. At the same time, you were just 10 minutes from grand Lake, maybe 20 from Granby, and not much farther to Winter Park. First impressions of the cabin are that it’s very rustic, but there is a surprise lower level with a very comfortable carpeted Family area and a steam shower. We had four adults, two babies, and a toddler, and the set up was pretty perfect. The owners are clear that the place isn’t baby proofed, but we didn’t have much trouble keeping them out of trouble. We were a little concerned about whether there would be enough to do during the winter since we don’t snowmobile, but there definitely was. Cross country skiing, the park, restaurants, sledding at the grand Lake Nordic Center, and hanging out and playing board games. Definitely recommend it! Only downside no washer and dryer, other than that it's a beautiful house to relax and enjoy! We are glad that you enjoyed your time in our lakefront home. Due to some constraints beyond our control we are unable to offer the use of a washer/dryer at this time, but are hopeful that we might be able to add a washer/dryer in the near future. There is a wonderful laundromat in the town of Grand Lake, less than 3 miles from our home. This was the third year we had stayed at this location, we love that the house fits the size of our family so well and that we are able to have man’s best friend along. We spend most of our time outside on the deck with the amazing views and that easy access to the small lake. Love that we always see elk and moose in the vicinity. We will continue this tradition as long as possible, It is the highlight of our summers. We stayed for five days with our family of 9 and two dogs. We had tons of fun and a relaxing time. The cabin was clean, nice, and had everything we could've needed. Close enough to Grand Lake to spend a day there and close enough to RMNP to explore there as well. We'd definitely recommend this cabin to others! Some spring, fall & winter weekends require a 3 night minimum. Please contact us to inquire about our more flexible rates and conditions than VRBO is able to publish for a very small number of people in the slower seasons. Please contact us if you wish to bring a pet. We will accept one pet with prior approval. Pets must be kept on a leash when outdoors. It is important to pick up after your pet. There is an extra charge for pets. We want to have the opportunity to let you know of our pet policies and also about all the wildlife in the area which might pose a threat to your dog. We strongly advise our guests to purchase travel insurance to cover the cost of needed cancellations for reasons covered by the insurance. The $400 security/damage deposit is also used to cover excess cleaning, pay-per-view TV, excess Internet charges if any, excess number of people, pet droppings not picked up, etc. and is fully refundable if all is left in order and no additional charges have been made for the above services. Our home is in a spectacular lakefront location! Wildlife viewing in this area is usually awesome.